Komi, short for komidashi, is a Japanese go term adopted into English. It refers to the compensation points given to white to offset the starting advantage that black has. Its value has changed over the years, and although it is now generally 6.5 or 7.5, it started as low as 2.5. The use of komi is now so completely ingrained, it is hard to imagine go without it. 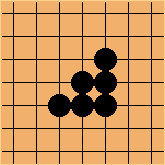 But just 100 years ago, komi was hardly ever used, and its introduction in professional go was controversial. The ladder is one of the most basic tactical techniques there is. It owes its name to its distinctive zigzag shape, reminiscent of a stairway. Although one of the first techniques learned by beginners, that does not mean ladders are only for beginners. Professional players are constantly contemplating potential ladders, and will often play a certain variation only if these potential ladders work to their satisfaction. Although most ladders follow simple diagonal lines, the presence of other stones may cause ladders to bend or shift. This has led to some players composing ladder problems, in which a player is challenged to read out a ladder trough all its twists and turns, often taking over 100 moves. Yi Ch'ang-ho (이창호, also commonly written Lee Chang-ho) is a 9 dan professional player from South Korea. He is nicknamed the stone buddha, in reference to the fact that he shows little emotion and has a peaceful style, with which he yet more often than not comes out on top. Yi holds the record for most titles won, both domestically and internationally, with a grand total of 17 international titles. He is generally considered to have been the strongest player of the late 20th and early 21st century, and is still one of the top players today. There are a lot of shapes in the corner which occur regularly. To save yourself the time of reading out their status every time, it is useful to study these basic shapes and remember what their status is. This article gives a comprehensive overview of all the different corner shapes, such as L-Groups or J-Groups. It explains whether their status depends on whose move it is, what the result is (life, death, seki or ko) and how this depends on conditions like their outside liberties or additional stones nearby. Shortage of liberties, also know by the Japanese name damezumari, refers to situations where a shape defect or lack of outside liberties changes the result of a local fight. 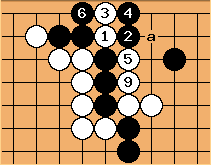 Exploiting an opponent's shortage of liberties is an important technique, forming the basis of several well-known tesuji, and is used often in tsume go problems. 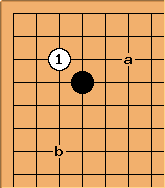 In the example diagram, black would like to play a in order to make two eyes, but doing so puts his stones in auto-atari. This is caused by the shortage of outside liberties. 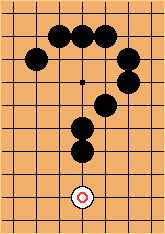 If were not occupied, for example, black could play at a and live. Although the 4-4 point has many advantages as an opening move, one of its disadvantages is the fact that it is very easy for the opponent to invade on the 3-3 point. 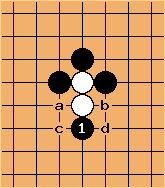 Even when Black has stones nearby, for example on one of the points a or b, white can still successfully invade here and make a living group. 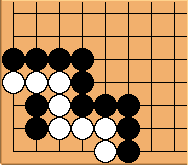 After the invasion, black has several choices to make in his response, beginning with the choice of which side to block. This and other choices depend on the overall position on the board. The two stone edge squeeze, also known as the stone tower tesuji, is a technique that allows an attacker to completely spoil the eye shape of a group, while at the same time severely reducing its liberties. The diagram to the left shows an example. 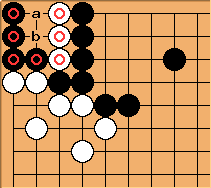 After the defense of at , white can play a and capture all of black's stones. Benjamin Teuber and Hwan-Kuk Kang report on their experience of studying with Korean Go students (Yeongusaeng). They have visited the very same school that produced players like Yi Se'tol and Choi Cheolhan. If you have ever dreamed of becoming a professional player, this article is a must read! Haeng-Ma is a Korean term, which means the way the stones move. It refers to the interaction between stones depending on their relative locations, and covers many important tactical concepts. This tutorial for beginners covers the basics in six articles, and is a treasure trove of tactical tips and tricks. A lot of good advice, will show you new ways to look at how groups develop and how fights are fought. 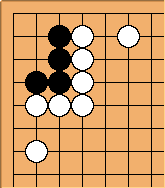 Go Seigen (呉清源), is one of the strongest go players in the history of the game, perhaps even the strongest player ever. Born 19 May 1914 in China under the name Wú Qīngyuán (吳清源), his talent for the game quickly became apparent. He started playing when he was 9 years old, a relatively late age for top player, but by the time he was 12, he was already of professional strength. His excellent results against visiting Japanese professionals caused his fame to spread to Japan, and in 1928 he moved to Japan to start a professional career under the tutelage of Segoe Kensaku. By the time he was 18, he was already among the very small elite of the absolute top players of Japan, and it was at this time that he started studying the famous new opening strategies that became known as Shin Fuseki, together with his friend Kitani Minoru. Sensei's Library's beginner study section is a real treasure trove of information for players who have just started. If you've just learned the rules, this is the place to go! On one of Sensei's Library all time favorite pages, learn about the awesome power of the B2 Bomber formation. It's deadly combination of stealth and firepower has turned many a game around. Even by simply showing up on the board, the B2 Bomber may completely dishearten your opponent, causing him to surrender instantly. It has been reported that the B2 Bomber was used to devastating effect by the child super talent Fu Ling Yu. 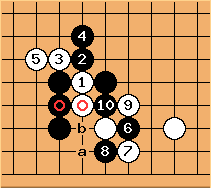 For examples of the B2 Bomber's awesome power, see these tsumego problems. Recently, Cho Hye-yeon wrote a series titled "With Rui Naiwei..." on her personal weblog. The series starts with a childhood anecdote where she first learned about Rui Naiwei, the strongest women in the Baduk world. Soon Cho Hye-yeon, turned professional at the age of 11, had to face Rui Naiwei in tournament play. But the story isn't simply a story about Rui Naiwei, it's her story. The story of a young Baduk professional growing up in the overwhelming presence of someone so strong as Rui Naiwei. She freely shares her thoughts and doubts, tells about those decisions she learned to take for herself despite opposition from press and Baduk fans, such as not attending matches on Sundays. 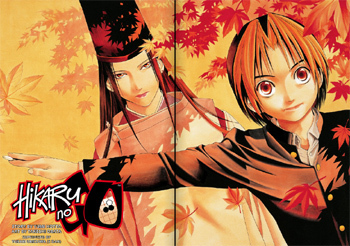 In short, it isn't the kind of sweet story about being a professional readers of Hikaru no Go are used to, but the story of a real professional, candidly told by herself. The McMahon system tournament is by far the most popular form of tournament used in amateur go. It provides every contestant with interesting opponents that are roughly of equal playing strength. This page explains how the McMahon system work. How to assign initial scores based on playing strength, how to pair players in each round, and how to process the results. If you're always wanted to know what that wall list full of numbers meant, this is a good place to start! Earlier this month, we featured a series of articles about two of the strongest female professionals out there. This week, we will look at a very new one. Joanne Missingham, a 14 year old girl from Australia was promoted to professional shodan last year. 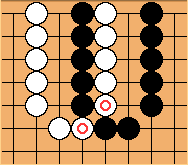 Whole Board Thinking in Joseki is a series of books by Yang Yilun, currently consisting of two parts. The books take a completely different approach than the common "joseki dictionary" format. Each joseki is shown in context, and the focus is on how the context decides whether a joseki is good or bad, and on how to choose a joseki given a certain context. To this purpose, the book presents many problems, where the reader is asked to choose a joseki in one of the corners with the position of the rest of the board in mind. Rank - worldwide comparison is a well-known page on Sensei's Library. It mainly consists of a table comparing ranks over different ranking systems, both online and offline. While this table is widely read and often criticised it hasn't seen a major revision for a long time. For this revision, we need your help. If you have a stable rank in more than one system (be it online or offline), please add your data to our data collection. 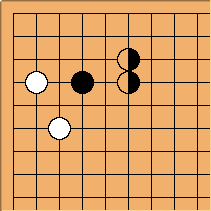 The Beginner Exercises series of tsumego problems is one of the most popular features of Sensei's Library. This series is ideal practice material for those who are comfortable with the rules, but are still lost when reading most situations out. These exercises will both improve your reading and give you a good set of standard situations to look for. Stronger players, well past the beginner level, may also benefit from doing these exercises quickly in order to train their instincts. And don't count on getting them all right the first time either! Rui Naiwei (Chinese: 芮乃伟, Hanyu Pinyin: Ruì Nǎiwěi, born December 28, 1963) 9-dan is considered the strongest female player in the world. Born in Shanghai, China, Rui Naiwei began to play Go at the relatively late age of 12. She turned professional in 1985, shortly after the introduction of professional dan ranks in China, and became 7 dan immediately. She was promoted to 8 dan in 1986 and 9 dan in 1988, the first woman to ever be promoted to this level. 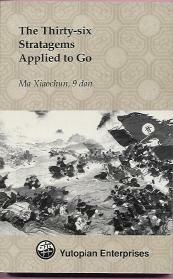 Rui left China abruptly in 1989, just after the Tiananmen Square Massacre, moving first to Japan, and then to America. She now lives in Korea, where she competes in professional tournaments. In 1999, she took the Kuksu title, becoming the first woman ever to hold an open title. Some 300 years ago, towards the end of the Ming Dynasty (1368-1644) an unknown writer published "Secret Art of War: The 36 Stratagems" writing down for the first time war stratagems which first appeared in the official history of Southern Qi about 1500 years ago. "The 36 Stratagems" is a military classic of ancient China and has its emphasis on deception as military art. Ma Xiaochun has written a book about their application, and here we discuss Sensei's Library's take on how those stratagems might apply to go. Lee Sedol (이세돌 Yi Se-tol, born March 2, 1983) is a Korean 9-dan professional, and is considered by many to be the current best player in the world. His reign as such started around 2003, when he won the LG Cup against Lee Chang-ho, his main rival, while also defending his title in the Fujitsu cup, earning him promotion to 9 dan. In the following years, Lee won an impressive number of major titles, internationally as well as at home. In 2009, Lee has announced that he will take a one and a half year sabbatical. He will start playing again in January of 2011. Benjamin Teuber (6d) studied as an insei in Japan. Here, he gives tips on becoming a stronger player, based on his experiences as an insei, and on the advice he received while studying in Japan. This advice is useful for players of all levels, from those who have just started playing to those who are already 6 dan. The European Go Congress is a two week event, held in one of the member countries of the European Go Federation every year. The event normally starts in July and ends in August, spanning a total of 16 days. During the congress, the Open European Championship is played. The 2009 Congress is held in Groningen, the Netherlands, from July 25 until August 8, and is running right now. Next year, the congress will be held in Tampere, Finland. The US Go Congress is a one week event organized by the American Go Association. The congress is held in a different state every year, and is normally held in the first week of August. The congress includes the US Open, which is the largest tournament in North America, as well as the North American Ing Masters Cup and the Redmond cup (qualifier for the World Youth Championship). The 2009 Congress is being held in Fairfax, Virginia, and is running right now. 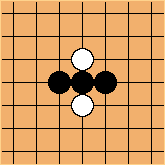 The summer vacation is almost over, and for many of you a new season of go is starting. Get in shape with this excellent series of go problems! Gokyo Seimyo (碁經精妙 Gokyō Seimyō, Best of the Go Classics) written by Hayashi Genbi and published in 1835 as a sequel to Gokyo Shumyo. The Gokyo Seimyo Tsumego Series on Sensei's Library focusses on Volume 3 of Gokyo Seimyo, the life and death problems. 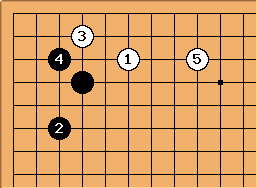 Joseki are generally agreed-upon sequences of play, mainly in empty corners, resulting in what is considered a fair outcome for both players. 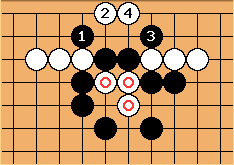 Joseki is an important area of study in Go, because it is a byproduct of the interactions between the Black and White stones at the corners and sides during the opening phase of a game. Seki, a Japanese go term adopted into English, means mutual life. In its simple form, it is a sort of symbiosis where two live groups share liberties which neither of them can fill without dying. 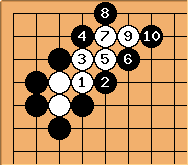 While an elementary topic in Go, many different types of seki can appear in Go. The seki page contains only a sampling of the possible kinds of seki that may occur. Sensei's Library covers a broad range of material, not just encyclopedia or dictionary entries. There are no go professional contributors, but we do have informed amateur opinion, scholarship, pedagogical material, and original research, the kind of material that might appear in a journal. The SL Journal will provide a portal to such material, as well as a venue for commentary and debate. Chapter 2 - Four basic shapes of Fan Hui's book L'âme du go - les formes et leur esthétique (The soul of go: shapes and their aesthetics) has been translated to English and made publicly available on Sensei's Library. The KGS Go Server, or simply KGS, is a popular Go server that can be accessed at http://www.gokgs.com/. It is common to have more than 1500 people logged in at any time, making it one of the largest Go servers in the world. Many high profile tournament games are relayed on KGS. The Big Question Mark, or BQM, is said to be one of the better features of Sensei's Library. At the BQM, people are welcome to ask questions on any Go-related topics, such as life-and-death problems, opening and joseki questions, middle-game invasion issues, endgame queries, and so on. When the question is a one-liner, it may be posted at Quick Questions instead. A capturing race is a mutual capturing contest: The first player to put the opponent into atari and then capture their stones wins the race. Usually the winner of the race (the player who makes the capture) makes life for their group. Both groups in the race are enclosed, have at most one eye and are reducing each other's liberties. Here is a blog of my teaching activities, in pursuit of the "lecture of God". The experience has taught me that there is no single method that works, because the audience and the conditions can widely vary, but there are definitely methods that don't work. In Dieter's blog he explained how he tried different teaching methods for different people under different conditions, with varying results. They contain a wealth of wisdom and insight, and definitely an interesting read. A list of collections of go problems that can be found on the Internet. These collections are in various languages, including English, Chinese, and Japanese. Minoru Harada's No. 703 (2009 October 12) elementary problem: Black to play. This page presents a visual method for beginners to recognize what is an eye. While this method is not mathematically rigorous, exceptions to this way is sufficiently rare enough that many Go players simply apply this method in their games. It is not easy to mathematically define an eye. There are many failed attempts at Formal Definitions of Eye. This page gives the time lines in the historical development of Go, sorted by countries. These include China, Japan, Korea, and others. The target audience is beginners who just started playing Go, up to perhaps 15 kyu. This page gives an overview of some common patterns that can occur in the opening. Kajiwara took over for Kitani Minoru at the famous Kitani Dojo for a time, whem Kitani became ill, and taught pupils such as Ishida Yoshio, Kato Masao, and Takemiya Masaki. Kajiwara died of kidney failure on november 28, 2009 at the age of 86. Pushing battle is an important but neglected concept in the literature. It is a well known technique to sacrifice some stones in order to kill a group. But sacrifice too many, and the eyespace will be too large to kill the group. Without defects, like cutting points, any 7 space eye-shape in the center is alive. This page examines how many stones you can sacrifice while still being able to kill the opposing group despite the resulting eyespace. Several positions with extremely large captures are given for your problem solving enjoyment, to tide you into the new year.